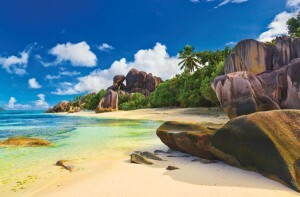 Great Safaris Seychelles – 5 Days extension takes you to “heaven for beach lovers”, the Seychelles. The Seychelles archipelago is comprised of 115 islands in the Indian Ocean, off East Africa. Aside from its numerous beaches, coral reefs and nature reserves, it also hosts rare animals such as giant Aldabra tortoises. The main island, Mahé, is a hub for visiting the other smaller outer islands, which are accessible by boat or small aircraft. There are resorts and hotels to cater to all tastes. Whether your style is a quaint B & B or a super luxurious resort, the white powder beaches and green-blue waters embrace, soothe and seduce on our Seychelles – 5 Days extension. Our Seychelles – 5 Days extension includes: 4 nights ocean side resort, airport transfers and breakfasts.